Caption slip reads: "Photographer: Wyman. Date: 1958-03-02. Reporter: Donoghue. Assignment: Chinese opera. 20-58: Opening scene of 'The Eternal Dreams of the Emperor Huan.' L to r: Dear Nam (a scholar), Dim Sin Hong (brother of Wai, girl friend fo the Emperor) and Mino Lo (cast as Wai). 47-48: Lim Sin Hong on stage. 10-77: Geraldine Fong, of Hong Kong, reading changes in script for her role as Empress Huan. She was the 'meanie' of the opera. 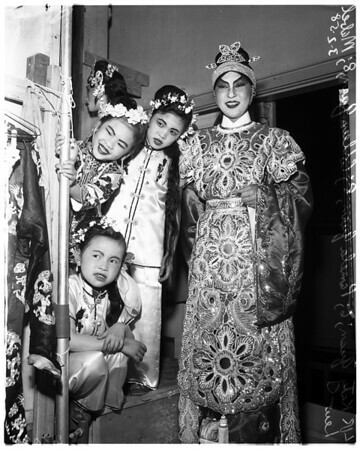 9: At right Mabel Lew of San Francisco, who played role of Emperor Huan, with three little Huans, played by upper l to r -- Pamela Quan, 8, and Colleen Quan, 8, and at lower left, Katy Quan, 6, all members of one of the families making up the Four Families Assn. ".